With iconographic zeal, Iwan Bala shifts his hallmark imagery onto a new three dimensional level with the exhibition and book, Offerings + Reinventions. 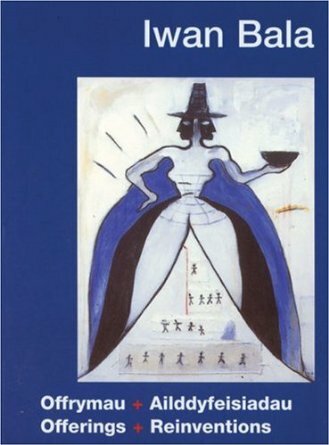 In a typically forthright and self-revelatory essay he traces his artistic development, acknowledges crucial international influences from Zimbabwean sculpture to the Cuban Santeria tradition and expands on the theory of Custodial Aesthetics first expounded in Certan Welsh Artists. Inventive, poetic, politicised, Bala confirms his position as one of the most radical and influential artists working in Wales, combining as he does the mythological inheritance of Wales and other countries with painting and installation.